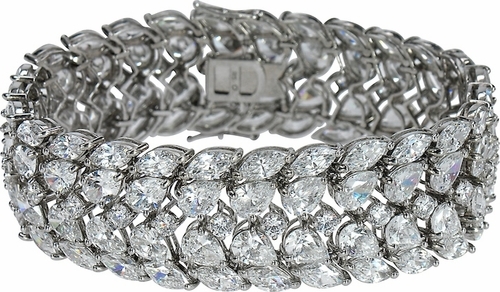 The Cleo .75 Carat Each Marquise and Pear Cubic Zirconia Estate Style Bracelet adds a regal look that is truly amazing! An assortment of diamond quality .75 carat 8x4mm each marquise and .75 carat 7x5mm each pear shapes are basket set in a beautiful arrangement with additional cubic zirconia rounds that line the center. 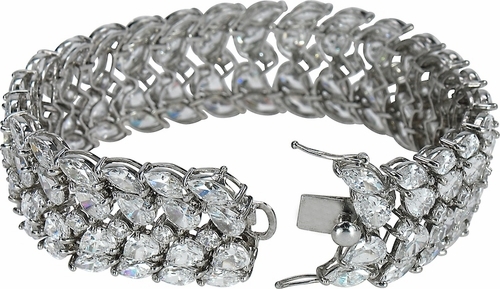 The bracelet measures just under an inch wide and secured by a double hinged safety clasp. It is flexible and comfortable! 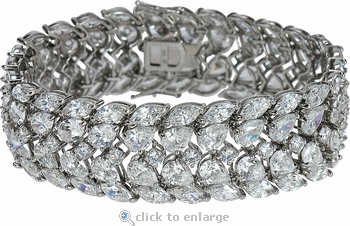 This bracelet is available in 14k white gold or 14k yellow gold and in your choice of a 7 inch length or upgrade to a 7.5 inch or 8 inch length, please see the pull down menu for options. For further assistance, please contact us directly at 1-866-942-6663 or visit us via live chat and speak with a knowledgeable representative. See Matching Necklace item N1027.